An article written by Austin Smith for the October 2013 edition of AJET Connect magazine. On September 7th 2013, Tokyo was awarded the right to host the Olympic Games for the third time in its history. As well as famously hosting the 1964 Summer Olympics, Tokyo was awarded the right to host the 1940 Olympic Games, an honour which was later relinquished. The decision to award the 2020 Olympics to Tokyo has provided an opportunity to reflect on this Olympic history and to build upon the city’s rich Olympic heritage. My personal interest in the Japanese Olympic movement stems from the failure of Tokyo’s bid to host the 2016 Olympic Games – the stimulus for my MA research into the city’s Olympic history. The fact that Japanese cities have now been awarded the right to host Olympics more times than any Western country, with the exception of the United States, demonstrates how well they have represented themselves to the International Olympic Committee (IOC). In the case of Tokyo, these ambitions were first expressed to the IOC in 1932. It was hoped that the event could be held in 1940 to commemorate the 2,600th anniversary of the foundation of imperial Japan. The event would have showcased the remarkable recovery of the metropolis, which had been devastated by the 1923 Great Kanto Earthquake in which approximately 140,000 people died. Regrettably, the ongoing war in China depleted national resources and an international boycott had been threatened. Ironically, but by no coincidence, the desire to host an international event to demonstrate modernity along Western lines had been extinguished by colonial expansion intended to promote ‘mutual prosperity’ in East Asia. The pre-war history of Olympic Tokyo has been whitewashed from the history of the Japanese Olympic Movement presented by the Tokyo 2020 team through their official website – even a short biography of Jigoro Kano, the founder of judo who worked to bring the Games to Tokyo until his death, fails to mention these efforts. By describing Tokyo as a victim of ‘unfortunate circumstances’ the issue of war responsibility is sidestepped. The 1940 Games were said to have been ‘cancelled’ rather than relinquished, leaving the responsibility for this cancellation open to interpretation. The fact that the city which was awarded the Olympics for 1940 was mostly destroyed by 1945 is also ignored. In awarding the Olympics to Tokyo, the IOC accepted Emperor Hirohito, the figurehead of wartime Japan, as the patron of an event which ostensibly promotes world peace. This decision was part of a ‘rehabilitation’ of Axis powers, Rome hosted the Olympics in 1960 and Munich followed in 1972. The desire to harness the heritage and history of 1964 is clear from the Tokyo 2020 bid material. A ‘Heritage Zone’ containing imperial sites surrounded by renovated Olympic venues features prominently in the successful 2020 bid. The 1964 Olympic Stadium is being redeveloped at a cost of $1 billion to host the 2019 Rugby World Cup and, now, the 2020 Olympic Games. The venue, symbolically, stands on the site of the former Meiji Shrine Outer Gardens – the favoured site for the 1940 Olympic Stadium. The Yoyogi National Stadium and the Nippon Budokan are two further symbols of 1964 that remain prominent landmarks of Tokyo, fifty years on. These multi-purpose buildings were designed to fuse Japanese and Western architectural styles and, their continued use, hosting a variety of national and international events, is a fantastic advert for Olympic legacy and testament to the vision of the architects. The award of the Olympic Games to Tokyo was a trigger for vast urban improvements by the Tokyo Metropolitan Government. A ten-year development plan for Tokyo was fast-tracked to improve the city’s poor infrastructure in time for the Games. The Tokaido Shinkansen service between Osaka and Tokyo commenced on October 1st 1964, just nine days before the Olympic Games began. This rail service is still regarded as one of the safest, fastest and most efficient in the world. These developments were internationally recognised as symbols of Japan’s revival and post-war industrial growth and, in popular memory, they are directly associated with the 1964 Olympics. Eighty-five percent of the Japanese population watched the 1964 Olympic opening ceremony on television, in what was seen as the start of a new era for Japan. Sakai Yoshinori was chosen to carry the sacred flame into the stadium and light the Olympic fire. Sakai was born on August 6th 1945, the day the atomic bomb was dropped on Hiroshima, 17km from ground zero. Sakai has been described since as a ‘beautiful body’, a symbol of Japan’s ‘complete recovery’ following war defeat. Like all Japanese participants in the torch relay, Sakai represented a revitalized post-war generation, yet, he was also a reference to Japan’s position as the world’s first atomic victim. The opening ceremony linked Olympic symbols of peace with a not so peaceful history and broadcast them to an international audience. The Japanese flag, national anthem and imperial family were offered to be reaccepted, globally, as symbols of modern Japan. As well as shaping international perceptions of the city and transforming the urban fabric, the success of the 1964 Olympics galvanised subsequent Japanese Olympic bids. Sapporo and Nagano would go on to become Olympic host cities in 1972 and 1996 respectively. Unsuccessful bids from Nagoya, for 1988, Osaka, for 2008, and Tokyo, for 2016, were also launched. Whatever your opinion of the Olympic Movement, it is important to view the case of Tokyo 2020 from a Tokyo perspective. The chance to reflect on, revisit and restore the remarkable Olympic legacy of 1964 is something to celebrate. Tokyo has demonstrated in the past that it is capable of delivering a well-run event and creating a lasting urban legacy, there is no reason to begrudge the capital the chance to do so again. Tokyo 2020 will hope to demonstrate a historic narrative of Olympic Tokyo to the world – the theme of recovery. The Great East Japan Earthquake struck on March 11th 2011, generating a tsunami of unprecedented scale. Tens of thousands of lives were lost, people’s homes were destroyed and vital infrastructure was severely damaged. 100,000 people remain displaced by the resulting crisis at Fukushima Daiichi nuclear plant almost three years on. While the incident is not an immediate threat to the people of Tokyo, it is important that the nation demonstrates a complete recovery to an international audience once again. The Sacred Fire Relay (1964) by Nakamura Hiroshi fits seamlessly into the “OUT OF DOUBT: Roppongi Crossing 2013” exhibition at the Mori Art Museum in Tokyo, both stylistically and thematically. In fact, the connection between Tokyo, the Olympics and the ongoing issue of Japanese militarism are as obvious today as they were in 1964. Tokyo was awarded the right to host the 2020 Olympic Games just two weeks before the exhibition opened. The Olympic issue must be considered against the exhibition’s post-Fukushima theme, the ongoing nuclear crisis which has led to questions being raised about Tokyo’s suitability as an Olympic host. “Roppongi Crossing” is a triennial exhibition offering a comprehensive overview of contemporary art in Japan. 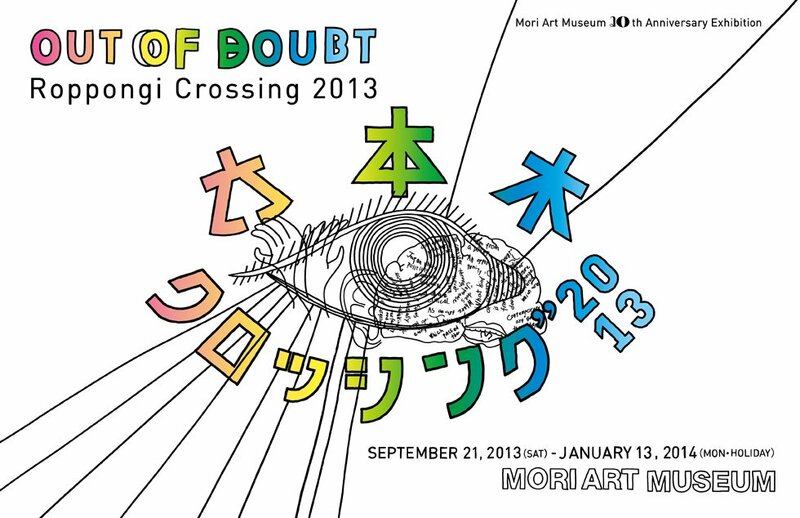 “OUT OF DOUBT” is on display at the Mori Art Museum from September 21st 2013 to January 3rd 2014. The exhibition features approximately thirty artists in order to give an impression of Japan’s post-war avant-garde art scene – including expatriate artists and artists of Japanese descent. In the first room of the exhibition, pieces by Nakamura Hiroshi (b.1932) are juxtaposed against the work of artists born in the 1970s and ‘80s – including, art from Kozama Sachiko (b.1972) completed earlier this year. This is billed by the curators as an attempt to start a ‘dialogue’ between the post-war generation of avant-garde artists and the current crop. 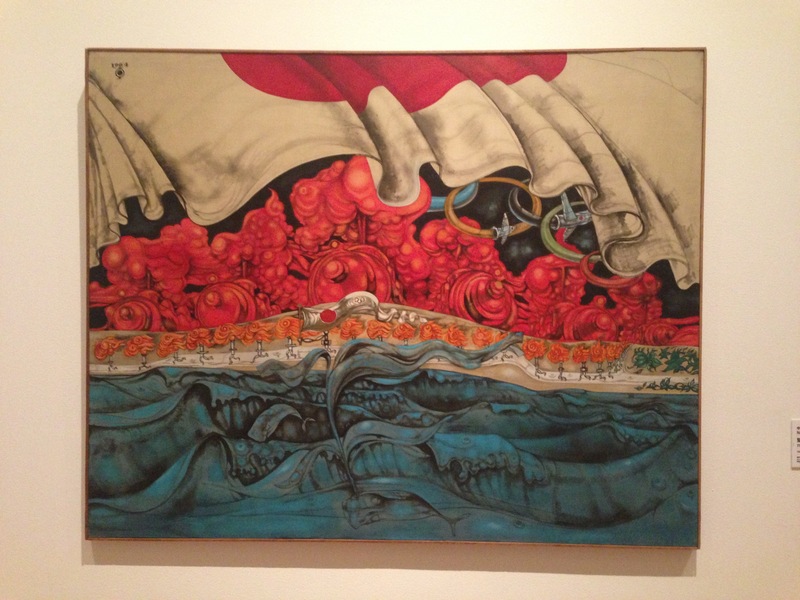 Post-traumatic comparisons are drawn between art created after The Great East Japan Earthquake (March 2011) and the post-war avant-garde movement of the ‘50s and ‘60s. Nakamura’s ‘reportage’ style is evident in his surrealist depiction of the 1964 Tokyo Olympic Torch Relay and Opening Ceremony. During the 1964 Olympics, the flag, the national anthem, and even the imperial family, were offered to be reaccepted by an international audience as symbols of modern Japan. Olympic plumes of smoke from Self Defence Force in at the Opening Ceremony, 1964. The Sacred Fire Relay, an oil on canvas painting, is dominated by the Japanese flag, under which Self Defense Force fighters mark out the Olympic Rings in plumes of smoke, as they did during the 1964 Opening Ceremony. Raging flames, reminiscent of an atomic blast or fire-bombed city, and de-humanised torch bearers dominate the centre of the canvas. Altogether, it is a powerful and chaotic, almost apocalyptic, scene. The flames evoke memories of Sakai Yoshinori, the final torch bearer, who lit the Olympic Flame in front of Emperor Hirohito and millions watching around the World. Sakai was born on August 6th 1945, the day of the atomic attack on Hiroshima, 17km from ground zero – a reference to Japan’s status as the world’s first atomic victim. Nakamura’s early work critiqued U.S. military presence in Japan, his inclusion of the Japan Self Defense Force in this piece can be seen as a continuation of this stance. Significantly, in recent months it has been suggested that the constitution may be changed to strengthen Japan’s regional military position and expand the Self Defence Force. However, Article 9 and the peace associated with it remain a source of pride for many Japanese people. 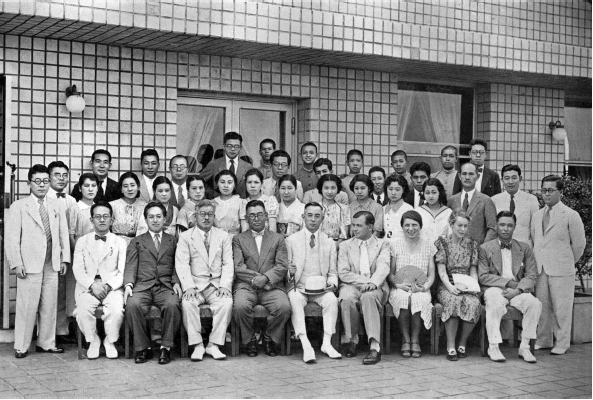 Nationalism and identity are themes of the “OUT OF DOUBT” exhibition, attempts have been made to go beyond the geographic boundaries of Japan by including expatriates and artists of Japanese descent. Through his work, Nakamura clearly questions the presence of nationalist symbols and militarism during an event that ostensibly promotes peace while heralding a ‘new beginning’ for modern Japan. The inclusion of The Sacred Fire Relay in the “Roppongi Crossing 2013” exhibition and the juxtaposition with contemporary art demonstrates that the concerns of 1964 remain relevant. Tokyo 2020: Issues Raised by the Olympic Torch Relay. Plans for the Olympic Torch Relay will begin in earnest if Tokyo is awarded the right to host the 2020 Olympic Games next month. The logistical concerns of the 1940 and 1964 Olympic Organising Committees would have to be revisited for 2020. With such a symbolic international event, how to best include Japan’s neighbours must be assessed. Tensions remain with South Korea and China over ongoing territorial disputes and the issue of wartime responsibility. 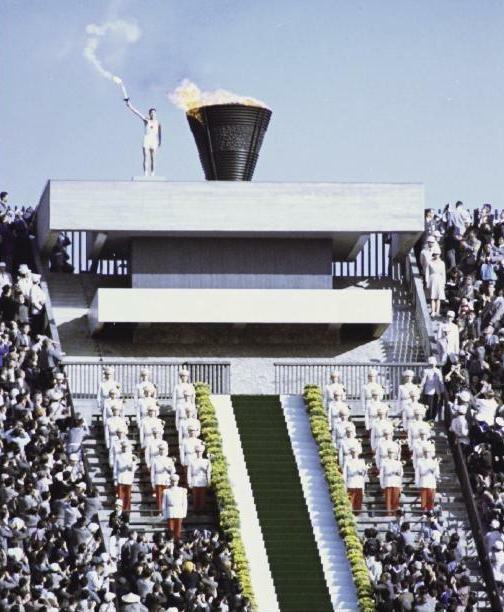 This article will look at the symbolism and logistics of the 1964 Olympic Torch Relay and suggest ways in which the Tokyo 2020 relay should be approached. The 1964 Olympic Torch Relay was a significant international event as it marked the beginning of the first ‘Asian’ Olympic Games. 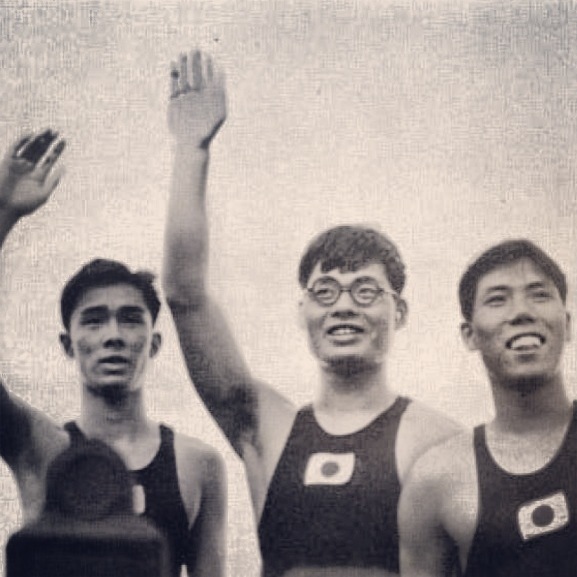 Proposals for the 1940 Olympic relay and the Asian Games torch relay of 1958 were revisited. Carl Diem’s 1930s plan, to follow the Silk Route across Asia, was considered and later dismissed due to the ‘numerous difficulties presented.’ As mentioned in a previous article, this route failed to conform to the vision of Asia that the organisers wished to promote in the 1930s, the same can be said of Japan in the 1960s. It was eventually decided that the torch would be relayed by air outside of Japan. The plane used for the air route was named ‘City of Tokyo’ and it stopped at Athens, Istanbul, Beirut, Tehran, Lahore, New Delhi, Rangoon, Bangkok, Kuala Lumpur, Manila, Hong Kong and Taipei before reaching Okinawa, an area still under U.S. occupation. The People’s Republic of China, the USSR and the Korean peninsula were notable absentees from this air-relay across Asia. The flame was then shared between four torches and transported from Okinawa by air to Kagoshima, in southern Kyushu, and to Sapporo, in Hokkaido. These torches were carried across four routes through major cities in Kyushu, Honshu, Shikoku and Hokkaido. The flames were fused in a unifying ritual, in Imperial Palace Plaza, on the eve of the opening ceremony. Hosting the Olympic flame overnight at Imperial Palace Plaza united imperial and Olympic themes while heightening the anticipation for the Games. As seen in the build-up to previous events, the association between the imperial family and modernity was being reinforced through the medium of Olympism. It was decided that the relay runners, within Japan, would be between sixteen and twenty years of age, representing the post-war generation and the rebirth of a modern nation. Seven runners completed the final section of the Olympic Torch Relay, between the Imperial Palace Plaza and the National Stadium, with Sakai Yoshinori chosen to carry the united flame into the stadium during the opening ceremony to light the Olympic fire. Eighty-five percent of the Japanese population watched the event on television in what was seen as the start of a new era for Japan. Sakai was born on August 6th 1945, the day of the atomic attack on Hiroshima, 17km from ground zero. Igarashi describes Sakai as a ‘beautiful body’, a symbol of Japan’s ‘complete recovery’ following war defeat. Like all Japanese participants in the torch relay Sakai was of an age that represented a post-war generation – a rejection of the scarred bodies of wartime Japan. Many commentators have remarked upon the similarities between the 1964 Olympic logo, worn on Sakai’s chest, and the Japanese flag – particularly when viewed from a distance against the white background. This uniform had been worn throughout the torch relay by both Japanese and foreign runners. Christian Tagsold goes as far as to draw comparisons between Sakai lighting the Olympic flame and the Japanese flag flying over battlefields during the Asia Pacific War. The opening ceremony was broadcast live to an international audience and, once the flame had been lit, Emperor Hirohito declared the Games open. The ceremony linked Olympic symbols of peace with a not so peaceful history. It was the first opportunity to demonstrate to the world that Japan and Tokyo had fully recovered from war defeat. Nationalistic symbols such as the flag, the national anthem, and even the imperial family, were offered to be reaccepted by an international audience as symbols of modern Japan. The promotion of peace was somewhat undermined by the Japanese Self-Defence Forces involvement in the opening ceremony. Eight members of the Japanese Maritime Self-Defence Force carried the Olympic flag into the stadium from the south entrance and hoisted it into place on a 15.21m pole as Sakai Yoshinori entered the stadium. 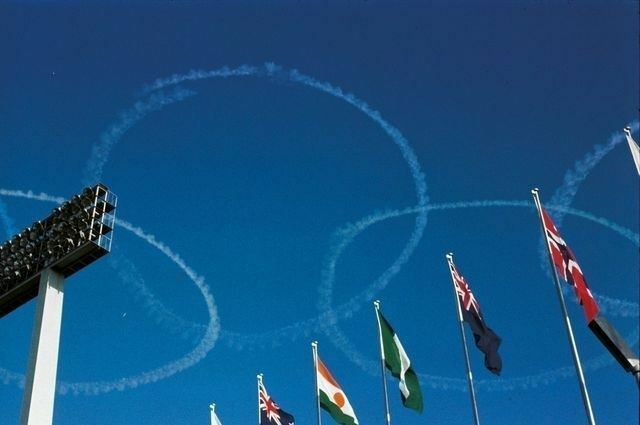 The Olympic rings were drawn by the smoke trails of five fighter planes from the Japanese Air Self-Defence Force. The Self-Defence Force was, and remains, a divisive issue in Japan as the establishment of the Self-Defence Force defied the constitution set out in 1947. The issues raised by the 1964 Olympic Torch Relay and opening ceremony remain contentious. It seems inevitable that the Self-Defence Force and the imperial family would be involved, particularly after the, well-received, London 2012 opening ceremony which showcased monarchy and militarism to the world. The logistics of the torch relay are far more uncertain, Carl Diem’s vision of a Silk Road relay was realised for the 2008 Beijing Games, making it the longest torch relay in Olympic history. Given the ongoing hostility in the region, it seems unlikely that this route will be reused, nevertheless, every effort should be made to incorporate Japan’s neighbours and promote mutual understanding. The Official Report of The Games of the XVIII Olympiad Tokyo 1964, v. 1, 245. C. Tagsold, ‘The Tokyo Olympics as a Token of Renationalization’, in Niehaus and Seinsch, Olympic Japan, 113-114. Y. Igarashi, Bodies of Memory: Narratives of War in Postwar Japanese Culture, 1945-1970 (Princeton: Princeton University Press, 2000), 153-163. S. Collins, ‘Fragility of Asian National Identity’, in M. Prince and D. Dayan eds., Owning the Olympics: Narratives of the New China, (University of Michigan, 2008), 192. Tagsold, ‘The Tokyo Olympics as a Token of Renationalization’, 113-114. Tokyo 2020: The Urban Legacy of Tokyo 1964. Tokyo Tower, May 30th 2013. 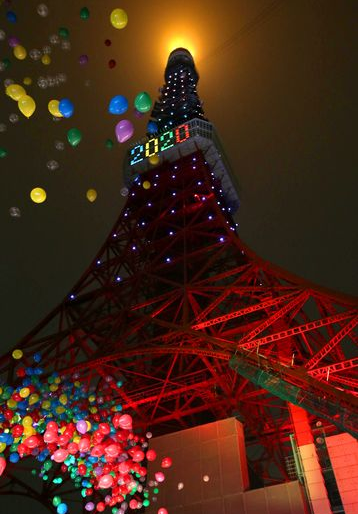 On May 30th 2013, Tokyo Tower marked one hundred days until the outcome of the 2020 Olympic bid process with a light display and the release of hundreds of Olympic-colour balloons into the night sky. This date also signified the handover of Tokyo Tower’s main broadcasting responsibilities to Tokyo Skytree. Tokyo Tower, completed in 1958, became a global symbol of modern Tokyo at the 1964 Olympics, it is hoped that the Skytree, the world’s tallest free-standing structure, can enjoy a similar legacy – with Tokyo 2020 as the defining event in its history. The Yoyogi National Stadium and the Nippon Budokan are two further symbols of 1964 that remain prominent cultural venues, fifty years on. Both will feature as part of a Heritage Zone if Tokyo’s 2020 bid is successful. These multi-purpose buildings were designed to fuse Japanese and Western architectural styles and their continued use, hosting a variety of national and international events, is a fantastic advert for Olympic legacy and testament to the vision of the architects. Preparations for Tokyo 1964 were under intense international scrutiny from the outset. The scale, complexity, and cost of the 1960 Rome Olympiad had led to calls for the Olympic Games to be scrapped. 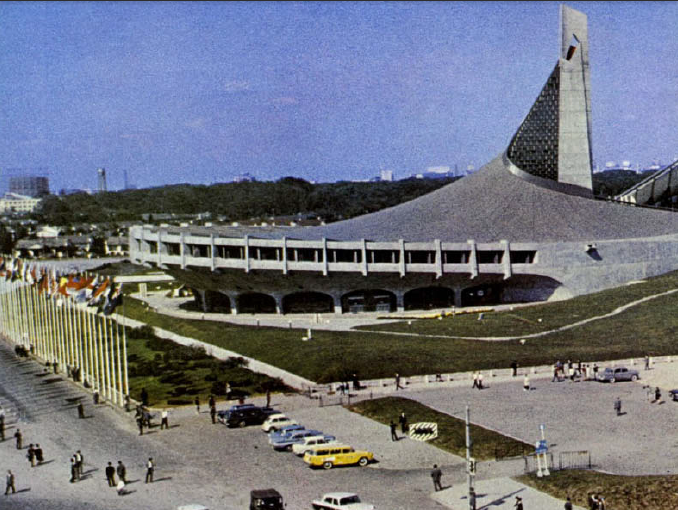 Fortunately, there was a carefully considered venue strategy for 1964 – to expand and reconstruct as many existing sports venues as possible (particularly those built for the 1958 Asian Games) and supplement these with the landmark installations outlined above. This strategy made the direct cost of the games manageable. 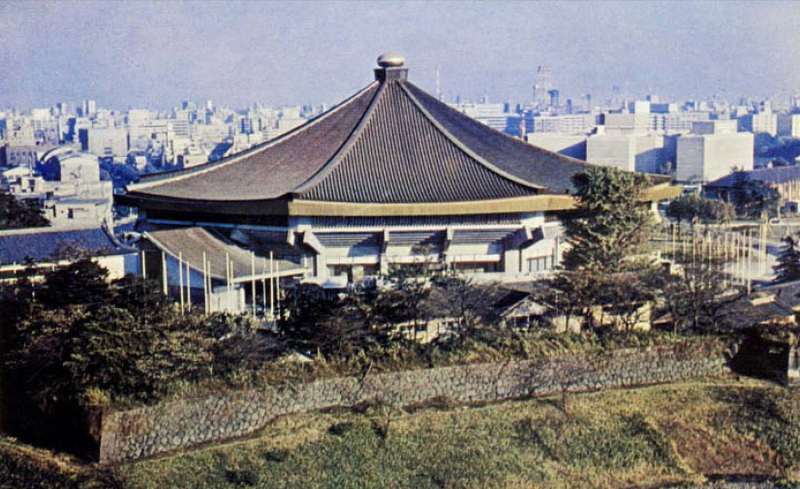 The Olympic Organising Committee were given the power to acquire state owned land, in prominent areas of Tokyo, yet venue location did not change significantly from the pre-war plans proposed for 1940. As the graph (below) demonstrates, the amount of money spent on Olympic venues and the Olympic village was just 2.75% of the overall Olympic driven investment and a relatively low overall amount in comparison with subsequent host cities. Remaining investment was aimed at developing a solid transport infrastructure and improving the backdrop of the Games, the city itself. Comparing investment in Olympic expenditure, Tokyo 1964 – Beijing 2008. The award of the Olympic Games to Tokyo was a trigger for vast urban improvements by the Tokyo Metropolitan Government. A ten-year development plan for Tokyo was fast tracked to improve the city’s poor infrastructure for 1964. These projects went beyond attempts to achieve ‘Western standards’ which resulted in a lasting legacy, both in the urban fabric and popular memory. Transport was the backbone of the project, to accommodate visitors during the event as well as the rapid growth of the city. Twenty-two highways were constructed at a cost of ¥72.1 billion and eight expressways at a cost of ¥105.8 billion. Two subway lines of 12.5km and 9.4km were specifically completed in time for the Tokyo Olympics and were integrated into the existing network, which was already subject to an eight line, 177.5km post-war expansion. 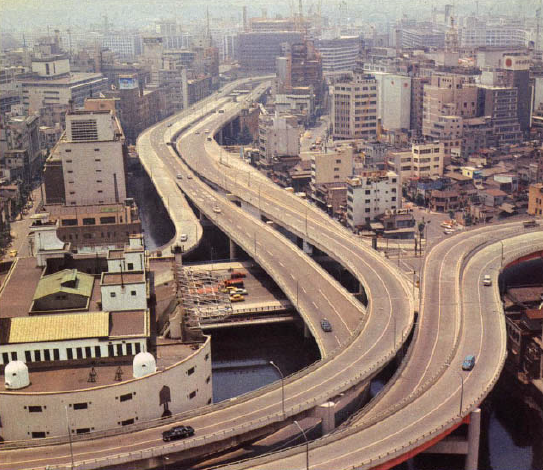 The newly constructed Edobashi Interchange, 1964. The Tokyo Metropolitan Government was determined to present a ‘clean’ city to the world, a ‘Beautification of the Capital Movement’ was launched and 4.7% of Olympic investment was allocated towards improving hygiene (more than that spent on Olympic installations). Tokyo was a city under constant construction, it was not until this period that pre-war urban planning problems were addressed. However, to assume the developments benefited the entire city would be misleading. Improvements were concentrated around affluent areas that would gain international attention, mostly within the Yamanote Line. Nevertheless, the achievements made in time for the 1964 Olympic Games facilitated the transition of Tokyo into a modern, prosperous metropolis. Ironically, like Tokyo’s Olympic ambitions, plans for a standard-gauge rapid train service originated in the 1930s. A plan for this system was drafted in 1939 and, although some work was carried out, it was completely abandoned by 1943 due to the need for steel to be used for military purposes. High speed rail was to be established across East Asia to connect the Japanese Empire, and, despite war defeat, there was no break in the pursuit of land purchases to allow the lines construction – 19% of land required had been purchased by 1943 and this was later supplemented by land devalued by U.S. bombing. In this respect the first bullet train of 1964 represents not only ‘modernity’ but also, a realisation of pre-war ambitions. The efficient transport network which was constructed in time for 1964 Olympics remains a major strength of Tokyo’s 2020 bid. Tokyo’s superb pre-existing infrastructure has contributed to the perception that the city is a safe option for 2020. Tokyo 1964’s status as arguably the greatest urban legacy in Olympic history is evidenced in the planned ‘Heritage Zone’ which will revive a remodeled Olympic Stadium, the Yoyogi National Stadium and the Nippon Budokan as Olympic venues. Tokyo Tower also stands in the Heritage Zone, to complete the connection between the Olympic legacy of 1964 and 2020. The graph is based on an example found in, H. Liao, and A. Pitts, ‘A Brief Historical Review of Olympic Urbanization’, The International Journal of the History of Sport, 23, 7 (2006), 1247., it has been edited to include data for 1968, (see Official Report of the Organizing Committee, vol. II, 23–4, cited in K. Brewster and C. Brewster, ‘Mexico City’s Hosting of the 1968 Olympic Games’, The International Journal of the History of Sport, 26, 6, (2009), 840-865). The data for Moscow 1980 has never been released. Total expenditure estimates vary from relative values of $600 million to $3,700 million. 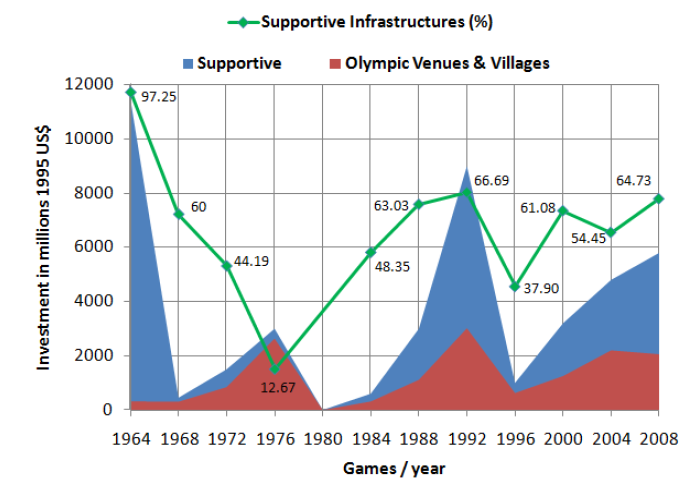 The ‘Supportive Infrastructure (%)’ is a useful indicator of how successful an Olympic legacy a Games has produced, e.g. the 1976 Olympic Games are generally considered to have a negative impact on the city of Montreal. The Official Report of The Games of the XVIII Olympiad Tokyo 1964, v. 1, 48. Y. Igarashi, Bodies of Memory: Narratives of War in Postwar Japanese Culture, 1945-1970 (Princeton: Princeton University Press, 2000), 143-163. The circular Yamanote commuter rail line services central Tokyo – only four of Tokyo’s twenty-three Wards fall within this boundary. ‘Japan: Fast Ride to Osaka’, Time, 4th September 1964. Tokyo 2020: Preparations for the 1940 Olympic Games and Lessons for Tokyo 2020. In the modern bid process, every aspect of the Games is documented in advance to help the International Olympic Committee (IOC) come to their decision. Tokyo’s vast 2020 candidature file outlines the Organising Committee’s Olympic vision in great detail, from planned venue installations to financing. In contrast, the specifics of Tokyo 1940 were mostly determined once the right to host the games had been awarded. Nevertheless, the key components of these preparations remain the same – venue location, the Olympic Torch Relay and the international message the Olympic city is trying to convey. The 1940 Games were to be a celebration of 2,600 years of imperial tradition marked by an event which was perceived as a symbol of Western modernity. The Olympic Torch Relay and sporting venues needed to interact with imperial sites and symbols while demonstrating the strength of the nation. In contrast, the Tokyo 2020 bid centres around innovation, inspiration and heritage, the slogan is ‘Discover Tomorrow’. Past Olympic sites have been retained as part of a ‘Heritage Zone’ – this is twinned with the ‘Tokyo Bay Zone’ featuring new and innovative Olympic installations. The first task following the award of the Olympics to Tokyo in 1936 was to create an Olympic Organising Committee. A twenty-six member committee was assembled which included Japan’s IOC members, the Mayor of Tokyo and the Japanese Amateur Athletic Association president. Controversially, Hideki Tōjō, the Vice-Minister of War, and Isoroku Yamamoto, the Vice-Minister of the Navy, were also made members of the committee. The work of the Olympic Organising Committee was to be hampered by controversy surrounding key decisions ranging from the logistics of the torch relay to deciding the site of the Olympic stadium. Increasingly nationalist rhetoric and the decision to include government ministers in the Organising Committee contravened the wishes of the IOC. Concerned that the Olympics were being portrayed as a ‘national’ rather than a ‘civic’ celebration, the IOC President sought to remind the Olympic Organising Committee that ‘The Games are given to the town of Tokyo and not to Japan’ while reasserting the rights and duties of the committee. The biggest problem facing the Olympic Organising Committee regarded the location of the Olympic Stadium. Their preferred site was the Meiji Shrine Outer Gardens, which had been billed as Tokyo’s ‘sports centre… a park dedicated to the Emperor who opened the Empire to Western civilization and who guided the destinies of his nation until 1912’. This imperial narrative was endorsed by the International Olympic Committee. For the 1940 Olympics, the existing stadium would have had to be enlarged to accommodate up to 100,000 spectators. The Shrine Office declared that the site was incapable of supporting a venue of this size. The Olympic Organising Committee faced a choice, between undermining the symbolism of the 2,600th anniversary Games and violating the sanctity of the Meiji Shrine in order to accommodate a Western event. It was ultimately decided that the main stadium for the 1940 Olympic Games should be newly constructed in Komazawa. 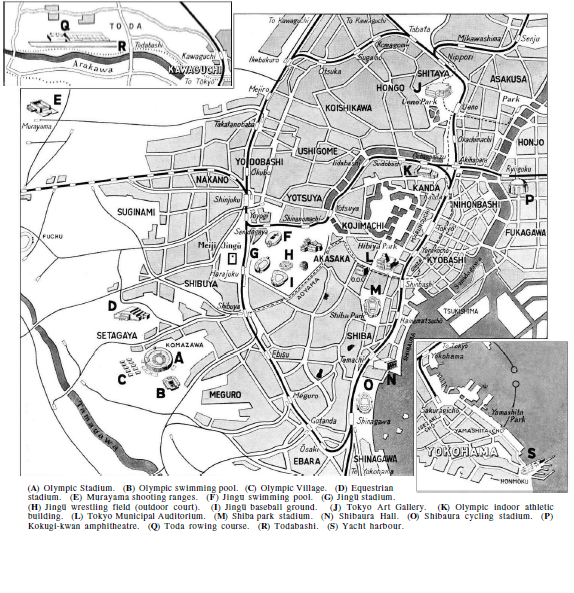 As the map (below) shows, although the Olympic Stadium and Olympic Village were to be located in Komazawa, a number of installations remained around the Meiji Shrine and the Imperial Palace. The Komazawa and Meiji sites would go on to become 1964 Olympic Parks with the vision for the Olympic Stadium realised in the former Meiji Shrine Outer Gardens. A map of Tokyo showing proposed venue location for the 1940 Olympic Games. The Olympic Torch Relay had been introduced for the controversial 1936 Berlin Games and the IOC was keen to establish it as an Olympic tradition. They favoured a plan by Carl Diem, Secretary General of the Organizing Committee of the Berlin Games and founder of the Olympic Torch Relay, which followed the Silk Route from Olympia to Tokyo. However, this historic route did not match the government’s nationalist vision of ‘Asia’ and the ongoing war with China made a continental relay impossible. Nevertheless, the transferral of the Olympic flame from West to East was seen as a significant symbol by Tokyo’s Organising Committee. Alternative routes were suggested, including a plan to collect the Olympic fire in Olympia with a warship and transport it to a harbour in Kyushu. 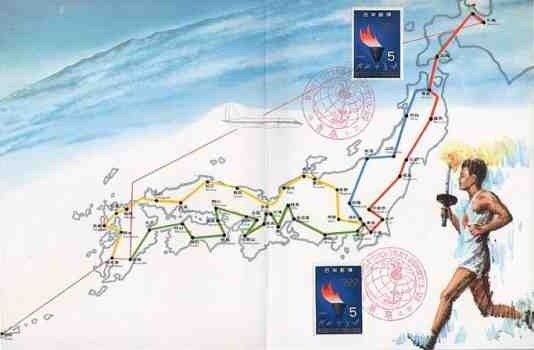 This revised torch relay was designed to include the symbolic imperial sites of Miyazaki and Ise before arriving in Tokyo – to emphasise the city’s position as an imperial capital. Ultimately, the debate over the torch relay remained unresolved and was to be a divisive issue again for 1964. Tokyo’s right to host the Olympic Games was forfeited on the advice of the national government on 15th July 1938. The Official Report for 1940 states that ‘the cancellation was inevitably due to the national policy in the present emergency.’ A telegram was sent to the IOC President which read ‘We regret that, owing to protracted hostilities with no prospect of immediate peace, we have decided to cancel the Tokyo and Sapporo Games. We intend to apply for 1944 Games.’ This use of evasive language in reference to the relinquishment of the Games and aggression in East Asia would come to characterise post-war dealings with the International Olympic Committee. The war in China had depleted national resources and an international boycott had been threatened. The Olympic Organising Committee did not receive either the promised funds or materials they had been allocated. Ironically, but by no coincidence, the desire to host an international event to demonstrate modernity along Western lines had been ended by colonial expansion intended to promote ‘mutual prosperity’ in East Asia. Marquis Kido, Minister for Public Welfare, later stated, ‘I am hoping that a national athletic meet will be held in the 2,600th year of the Japanese era as manifestation of our earnestness in the celebration of that year.’ This statement reveals a continued desire to combine imperial symbols and sporting prowess to mark the anniversary. 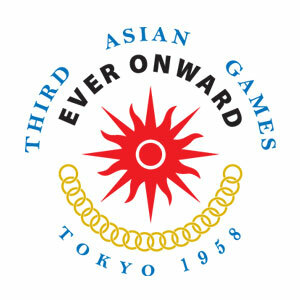 An ‘East Asian Games’ was staged at the Meiji Shrine Outer Gardens in June 1940, it was hosted by the City of Tokyo and the Japanese Amateur Athletics Association with the assistance of the national government. Athletes were invited from Japan, Manchuria, the Philippines, Thailand, Hawaii, and occupied China. A Shinto style flame relay was held from Kashihara, the place where Emperor Jimmu is believed to have descended to earth, to the Meiji Shrine. This commemorative event presented the imperial capital as the spiritual centre of a ‘new order in East Asia’ through the appropriation of an Olympic tradition. This pre-war history Olympic Tokyo has been completely whitewashed from the history of the Japanese Olympic Movement presented by the Tokyo 2020 bid campaign. Even a short biography of Jigoro Kano, who worked to bring the Games to Tokyo until his death, fails to mention these efforts. Yet there is a clear desire to harness the history of Tokyo 1964, through a heritage zone containing imperial sites and past Olympic venues. The ‘pre-history’ of these sites, outlined above, is absent from the current bid rhetoric. Nevertheless, this continued connection between imperial sites and sporting heritage lives on in the urban fabric of the city. The slogan for Tokyo 2020 is ‘Discover Tomorrow’ but the bid campaign should not ignore the city’s Olympic origins. The first instalment of the Tokyo 2020 series can be found here. S. Collins, The 1940 Tokyo Games: The Missing Olympics: Japan, the Asian Olympics and the Olympic Movement (London: Routledge, 2008), 90. Collins, The 1940 Tokyo Games, 112. Report of the Organizing Committee on its work for The XIIth Olympic Games of 1940 in Tokyo until the relinquishment, 121. 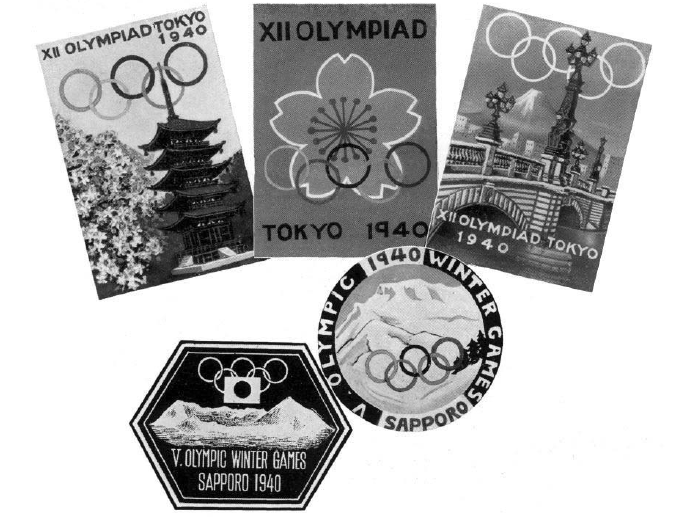 In 1937, Sapporo had been awarded the right to host the winter Olympics. Official Report 1940, 121. Tokyo 2020: Tokyo’s Olympic origins, 1930-1936. Japan has successfully hosted the Olympic Games on three occasions; the 1964 Summer Olympics in Tokyo, the 1972 Winter Olympics in Sapporo and the 1998 Winter Olympics in Nagano. In 1936, the 1940 Olympic Games were also awarded to Tokyo. However, the right to host the first Olympiad in Asia was relinquished due to escalating conflict in China. 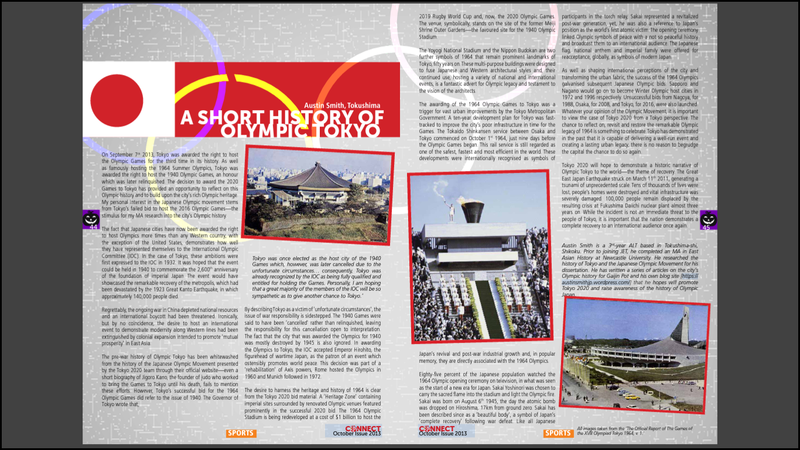 This article will revisit Tokyo’s first Olympic bid, from the first expressions of interest to the award of the Games to Tokyo. The fact that Japanese cities have been awarded the right to host the Olympics more than any other non-Western nation shows how well they have represented themselves to the International Olympic Committee (IOC). A successful Olympic bid must have clearly defined civic and sporting ambitions, in the case of Tokyo, these ambitions were first expressed to the IOC in 1932. An invitation from the Mayor of Tokyo was presented to the IOC by Kano Jigoro and Kishi Seiichi a month before the Los Angeles Olympiad. It was hoped the event could be held in 1940 to commemorate the 2,600th anniversary of the foundation of imperial Japan. The events in Los Angeles were arguably the most significant in the early history of the Japanese Olympic Movement. Not only was the desire to host the Olympic Games first officially expressed, the performance of the athletes identified Japan as a sporting nation. Kishi, a member of the IOC, was of the belief that athletic prowess, rather than the modernity of a city, signified whether a nation was seen as a viable host by the international community. He was also an advocate of strong participation to demonstrate bushido spirit and promote understanding of the Japanese race. A large team was sent to LA and it was hoped that a strong presence would encourage émigré who had suffered from the Californian Alien Land Laws. Seventy percent of the Japanese people in mainland USA lived in California, and there was a sense that a strong performance could challenge stereotypes. The Japanese flag was raised eighteen times as Japan won seven gold medals, seven silver medals and four bronze medals, finishing fifth in the medal table above Great Britain and Germany. The official report for Tokyo 1940 recalls that ‘the Japanese swimmers masterfully outclassed their rivals and won such laurels as surprised the sportsmen of the world’, a fair appraisal, as Japanese entrants won every men’s race but one. Similarly, the official report for Los Angeles 1932 recalls that Nambu Chuhei displayed ‘astonishing all-round ability’ by setting a new world record while taking gold in the triple jump, earning a bronze medal in the long jump and participating in the 4x100m relay. These performances were a measure of the progress of Olympism and Western sport in Japan. Japanese swimmers at Los Angeles, 1932. An official send-off for had been held in Tokyo, featuring a parade from the Meiji Shrine to the Imperial Palace, to the sound of the national anthem and cheers of “banzai!” This had served to unite imperial and sporting themes, this connection was reinforced when the victorious athletes returned to the city. The success in Los Angeles was officially celebrated to reinforce support for the 1940 bid. An estimated five million people lined the streets of Tokyo, waving the Japanese and Olympic flags as the athletes passed by. The Olympic fever generated by the results galvanised the bid campaign, as it fostered the idea that Tokyo should host the Games. The Los Angeles Olympics were a turning point in the level of support for the Tokyo bid and this was reflected by an escalation of the bid campaign. However, Tokyo’s Olympic bid can in fact be traced back as far as 1930. The campaign between 1930 and 1932 has been described as a one man crusade by Nagata Hidejiro, the Mayor of Tokyo. His desire to host the Olympics stemmed from the success of a ‘Reconstruction Festival’, held in March 1930, to celebrate the completion of the rebuilding project which followed the 1923 Great Kanto Earthquake. 1940 was identified as the next economically viable and politically significant opportunity as it coincided with the 2,600th anniversary of Imperial Japan. Nagata asked Dr Yamamoto Tadaoki, a professor of electrical engineering at Waseda University, to canvass the opinion of European mayors during the World Students’ Athletic Championship Meet in Germany. A press conference was held on his return from Europe to announce the campaign to host Asia’s first Olympic Games. Despite these efforts, the IOC was thought to be ambivalent towards Tokyo’s bid and so the decision was made to invite the IOC President to Japan. Count Baillet-Latour agreed to the visit on the condition that it was publicised as a private trip and his expenses were paid by the City of Tokyo. The official report recalls that, ‘throughout his sojourn of three weeks’, the president ‘inspected various sports stadiums and facilities for the Olympic Games in Tokyo and conferred with authorities concerned.’ Baillet-Latour’s visit was influential, the minutes from the 1936 Berlin Session record that ‘The President feels justified in recommending Tokyo to the choice of his colleagues, a choice which would mean the extension of the Olympic ideals to this part of the world.’ In addition, Kano emphasised the fact that the Olympics ‘have been celebrated in Europe and in the United States of America exclusively’ and declared ‘Asia wishes to have them in her turn.’ The vote was held the next day, and the decision was given in favour of Tokyo. The desire for Tokyo to be perceived as a modern city and as a leader of East Asia resonates with the Tokyo 2020 bid. The Beijing Olympics in 2008 twinned with China’s rapid economic growth has fuelled a desire to reassert Tokyo’s position as a global city. As we have seen, politics play a huge role in determining the successful Olympic host. Tokyo’s bid for the 2016 Olympics failed due to the IOC’s desire to host the Olympics in South America for the first time, as well as a perceived lack of public support. In Istanbul and Madrid, Tokyo is up against two major cities that are yet to host the Olympic Games. It remains to be seen whether Tokyo can harness its own Olympic history and be awarded the right to host the Games yet again. 1. Report of the Organizing Committee on its work for The XIIth Olympic Games of 1940 in Tokyo until the relinquishment, 1. 3. S. Collins, The 1940 Tokyo Games: The Missing Olympics: Japan, the Asian Olympics and the Olympic Movement (London: Routledge, 2008), 53. 4. Collins, The 1940 Tokyo Games, 53. 5. Collins, The 1940 Tokyo Games, 8. 6. Collins, The 1940 Tokyo Games, 7.